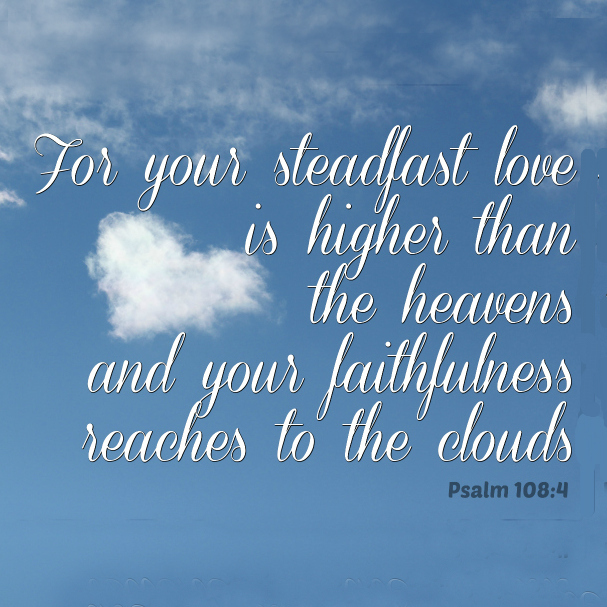 For your love is higher than the heavens, and your faithfulness reaches to the clouds. There are two principle Hebrew nouns at work here, and either of them might be translated differently than what's found in the NRSV. The first one, חֶסֶד, which is translated as love, might better be rendered as either kindness or faithfulness. Old translations often use mercy (such as by Henry below). With the second one, אֶמֶת, I feel the NRSV did an even poorer job. Instead of faithfulness, firmness or truth would've been a much better option (once again, see below). We cannot see further than the heavens and clouds; whatever we see of God's mercy and truth there is still more to be seen... in the other world. In other words, what we see of God's kindness and truth are but the tip of the celestial iceberg. The fact that we've now seen much farther into the universe than in King David's (or Matthew Henry's) day makes God's attributes no less vast. Regardless of how much of of the finite cosmos we experience, the tail end of infinite is still just the tiniest trace. And it's something that is to be experienced not only in the here and now, but also in the hereafter.